BERT KREISCHER is a standup comedian who performs to sellout crowds across the country and is known as one of the best storytellers of his generation. He has a brand new stand-up special, Secret Time that debuted worldwide on Netflix in August. 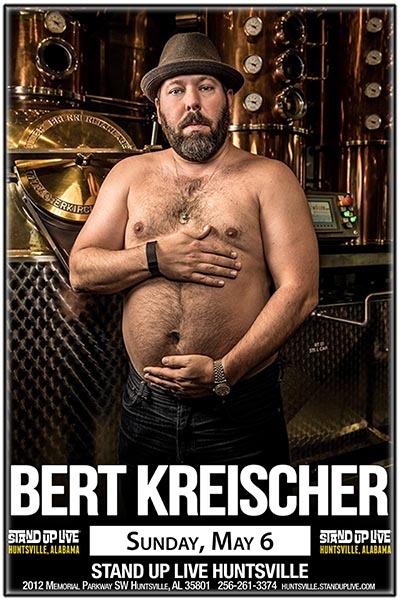 His previous stand-up special, Bert Kreischer: The Machine, premiered on Showtime, and clips from the special have been viewed millions of times over by fans around the world. He hosts a podcast out of his man-cave called The Bertcast and is the host / head chef on the popular digital series Something’s Burning on the AllThingsComedy network. TV audiences know him as host of the Travel Channel's Trip Flip and Bert the Conqueror. He is a regular guest on The Joe Rogan Experience and The Rachael Ray Show and has appeared on Late Night With David Letterman andJimmy Kimmel Live. His previous one-hour special Comfortably Dumb appeared on Comedy Central and his book Life of the Party, Stories of a Perpetual Man-Child shares the hilarious and outrageous stories that define his comedy and exemplify what has made him one of the most in-demand comedians working today.